After losing her sister and her faith in the world of medicine, Holly Peterson moves home to Wirralong along with her two nephews. 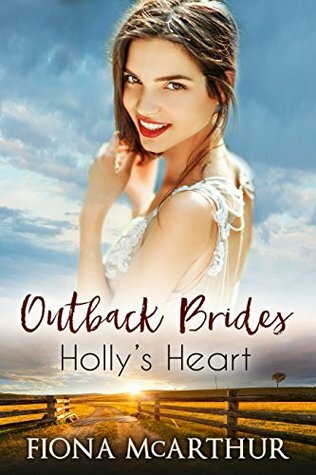 Determined to rebuild her life and create a loving home and a sense of belonging, she opens the Outback Brides Coffee Shop as her new vocation. When she learns that Ben Brieley, the man she said no to years ago is home to stay, Holly fears she’ll lose her heart and her focus on her nephews if she lets him in. I have to say this was a good book. Quick and easy read. I was disappointed not by the author but by the series that it didn’t complete the group story tell of the relationships. The Smart Ladies Club had one other original unmarried woman which was Serenity. Yet, she was not even mentioned in this book. Or if she was I don’t even remember it. She was such an in your face character it just seems odd for her not to have her own story. With that being said, this book is about the grandson of the woman who was causing Elsa and her husband to be all that grief at the hair salon before they got married. You know the one Mrs. Briely is the one Elsa kicked out of her shop for good. Her husband was the mayor of the town and the man with all the manners and sweetness. Yet, Mrs. Briely does cause not one bit of trouble or try to talk to Holly at all while she and her nephews were dating, doctor grandson, Ben. Who she raised after her son and daughter-in-law were killed in a car accident. There just seemed to be a lot of open-ended questions in this book compared to the other books in the series for me. You see Holly to is an emergency room doctor. But her sister is killed in a car accident and she is left to raise two six-year-old twin nephews. Their father had died a few years prior from cancer. So, she was the only living relative. She is stricken with guilt, mourning, and fear of how she is doing the right thing or not by them. She reopens her sister’s coffee shop. That does brisk business due to the Wirra Station Wedding Center. So, the business paid for itself actually. Since she was a barista in college it all worked out. But when Ben noticed her back in town and confronted her, she had to apologize for her bad manners and behavior. She explained how she always considered him a great friend. She had been in a bad place and had to back away. Never telling him that his grandmother had cornered her causing her to stop talking to him. Which in turn caused her to take out her anger on him and dropping their friendship. Which only opened the door as far as he was concerned to get himself back in her good graces. But he saw the sadness in her face and eyes. He had been secretly following her career. So, he couldn’t figure out what had happened. So, time to google. That’s when he figured out her career, her sister, and the twins were all in crisis. He needed her and she needed him. He decided to do something if only to be her friend again. So that was his next course of action on how to make that happen. I give this: 4 stars. Provided by netgalley.com.